Kites Academy provides Education program since 2006.According to Indian Govt. education policy that it is necessary to appoint trained teacher in every school. Modern time nursery schools are the root of basiceducation. So N.T.T. is necessary in present time to get better jobs inpre-primary education field. The national policy of education adopted in 1986by Govt. of INDIA recognized the need of early childhood care & education and emphasized the need of all round development of child during the critical early age. The N.T.T. course is designed to develop these abilities in teachers.N.T.T. is pre-requisite to become reputed teacher in reputed nursery conventand English medium schools. 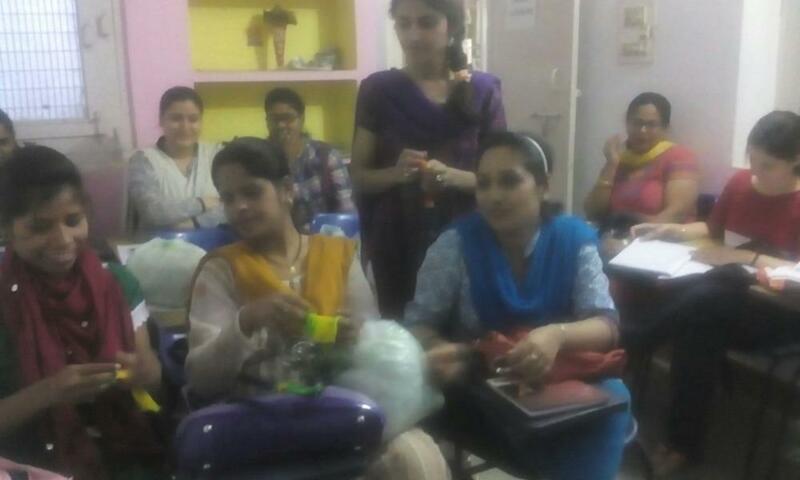 The untrained in-service teachers from variousschools are also joining this course these days because N.T.T. has become essentialpre-requisite for teacher of nursery classes. Most of the nursery schools are run by non Govt. organization so this course can provide you opportunity to get in pre-primary private/ public school. Nursery teachers have a significant impact when it comes to encouraging the development and learning of young children. They play a defining role in delivering an appropriate experience for young learners who have varied learning needs. To develop the sensibilities a nursery teacher or an aspiring nursery teacher needs to be thoroughly trained to work with very young children because a nursery teacher helps in the smooth transition between home and play school by providing love and care and at the same time maintaining the natural rhythm of the young children. To become a nursery teacher one has to be sensitive to a child’s needs and cultivate patience. She must possess a pleasing personality and her manners have to be child friendly. Unfolding of a young child begins in a nursery and all they need are the care and nurture from trained nursery teachers who assume a very important role in facilitating growth and learning of a child. Kites Academy’s Diploma in Nursery Teacher Training Course provides a platform for aspiring as well as professional nursery teachers to facilitate child centric learning through storytelling, rhyming games and play.The course helps the nursery teachers to learn the methods of planned teaching through play and experiments. If one loves to help young children and give them a great start in life then with proper teacher training one can pursue a career as a nursery teacher. A nursery teacher needs to be creative and flexible with a focus on optimum child development. The course will be extremely beneficial for all those eyeing a career in this emerging area of education as a nursery teaching professional. Nursery teachers training course prepares the teachers to meet the demands of the young learners’ classroom. The course covers different methodologies and disciplinary techniques with a sharp focus on young learners.Kites Academy’s Diploma in Nursery Teacher Training (NTT) opens many doors to numerous jobs as the course aims to equip the trainees with the approaches and methodologies of pre-primary teacher training which will strengthen employment opportunities. The course will provide the skills and experience to teach children in the age group of 0-5 years as nursery teachers. After a few years of experience the nursery teachers can work as early year’s coordinator or as deputy head in a primary school. They can also apply for the post of nursery school in-charge who is responsible to run the day to day operations of childcare settings. The course could be immensely helpful for early childhood curriculum developer, consultant associated with nursery schools and even for those planning to open a pre-school. The course is suitable for not only nursery teachers but anyone connected with nursery education.